ALL STUDENTS! Deadline for submiesion of CONTRACTS to the Recorder's Office is WEDNESDAY, SEPTEMBER 19. General Announcements ALL STUDENTSs Student Affairs office reminds you to keep your rooms lecked. Thefts have been reported. NEW YORK TIMES Subscriptions are available this weekt Centact Billy, 355-8133, Box #5)0. The New College String Quartet normally rehearses Monday, Tuesday, Wednesday, and Friday in Music Room, College Hall, 9a00-lls30 a.m. All members of the college community are invited to drop in and listen, follow scores, and ask questions. ************************************** Recreational Activities Volleyball, every day, west of peol at 4.oo p.m. POLAR BEAR CLUBs early-morning swimaing, 7-8 a.m., Monday thru Fri., and 7a30-8a)O a.m. on Sat. 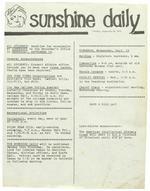 No Sunday ************************************** THE SUNSHINE DAILY will be published Menday thru Thursday. To contribute, look for labeled boxes in Hamilton Center, division offices, and South Hall. Notices must be received in boxes by 2s)O pm te appear in bulletin on following morning. al Tuesday, September 18, 1973 ************************************** TOMORROW, Wednesday, Sept. 19 Welding Sculpture barracks, 9 am. Gymnastics -4-6 pm, eutside of old barracks across from pool. Tennis lessone -courts, 1-J p.m. FACULTY MEETINGWed., 3 p.m. in the Teaching Auditorium. Choral Greup -organizational meeting, Wednesday evening. ************************************** HAVE A NICE DAY! Last-minute announcements The American Intellectual HistGry Class will meet in H-4 B (instead of Solarium) until end Qf term.